The draw for the second round of the 2019 Brunel Trophy was made on Thursday, March 28th. Matches are to be completed by May 2nd. The draw for the first round of the 2019 Brunel Trophy was made at the Awards Night on Thursday, February 21st. Matches were to be completed by March 28th. All matches in the competition are to be played to 11 points. The competition features a revolutionary double elimination format -- read on. Draws are to be made, starting with the first round draw in February, every 5 weeks or so -- next scheduled draw date to be announced when the current draw has been made. No previously drawn pairings will be allowed, unless this should become unavoidable late in the competition. Results not reported by the time of the next draw shall be deemed a defeat for both players unless evidence is presented to the Director which demonstrates that blame can be attributed to one of the players rather than both. Players losing for the first time in the competition stay in for the next draw. Players losing for a second time are eliminated. Where a bye is needed, this will be awarded to the player who has lost fewest matches in the competition so far. Where a tie-break is needed, this will be decided by the number of wins achieved in the competition by all of a player's opponents. In the event of two or more equal records, this will be subject to a draw. No player will receive more than one bye during the competition, unless all remaining players have already received one. Ties are then continued until all bar one player has lost twice. That remaining player is the winner. Entry fee elements to be paid by the players: �0. (This will include entry fees for intermediate qualifiers, which the sponsor will pay in full). The total will be divided amongst the top five players, as follows: 1st �0; 2nd �0; 3rd �0; 4th �0; 5th �. In the event of players finishing equal the prizes will be shared between those players. 44: Roland Herrera, Simonetta Herrera. 38: TIM LINE, Cynthia Roberts. 10: John Curran; Mandy Macdonald. 7: Chris Hughes, Jordan White. 5: SIMON BAKER, Jason Champion, Jim Green. 4: Cliff Blofield, Andy Boysan, Tom Chapman, Steffen Nowak, ED TURNER. 3: Marcus Evans, Adrian Farthing, Frank Jones, Dan Lowe, Rufus Rozelaar. 2: Ian Anderson, Derek Clew, Steve Cox, Miles Farren, Wayne Felton, Mary French, Hugh Swann. 1: Giles Ashton, Richard Biddle, Caroline Boulton, Drew Caudwell, John Chester, Anna Clarke, George Devlin, George Georgiou, Elias Hamati, Julia Hayward, John Hurst, Michihito Kageyama, Garry Kallos, Mike Kleinsteuber, Jerry Limb, James Lintell-Smith, Stuart Mann, MATHEW NICHOLLS, Fred North, Luke Owen, Chas Perry, Dave Pym, Jysen Quah, Mike Smith, Damian Thomson, Allen Tish, PAUL WATTS, Seb Wilkinson, David Wilson, Pete Wright, Neil Young. For any of the following Thursday tournaments (Monthly Grand Prix, GP30, GP5, Handicap Trophy, Speedgammon GP, Intermediates Trophy, Consulting Doubles Championship, Christmas Fizz Tournament): 1 point for every event entered. Participation in the 2018 Brunel Trophy: 1 point. 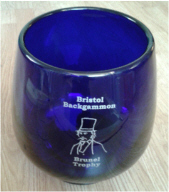 2018 Brunel Trophy winner (CECILIA SPARKE) and runner-up (ED TURNER); 2018 Premier One champion (SIMON BAKER) and runner-up (GAZ OWEN); 2018 Bristol Masters winner (ALEX HODGE) and runner-up (PAUL WATTS); 2018 Bristol Grand Prix winner (ALEX HODGE) and runner-up (IAN TARR); 2018 Premier Two Blue champion (TIM LINE); 2018 Premier Two Red champion (ADAM SINCLAIR); 2018 Premier Three champion (CARWYN JENKINS); 2018 Conference champion (MATHEW NICHOLLS); 2018 GP30 champion (GAZ OWEN); 2018 GP5 champion (NICK BARHAM); 2018 Speedgammon champion (IAN TARR); 2018 Handicap Trophy champion (ADAM SINCLAIR). These players will be shown in BLOCK CAPITALS in the list above. There will also be at least three "Director's Picks" to augment the field.